We would like to say a big thank you to all tenants, residents, staff, families and professionals who took the time to give us their opinions in our recent survey. The results are now being analysed and we will be feeding back on the findings in due course. Your opinions really do matter and will help us to improve our services. Congratulations to Gillian, one of our tenants at Edgcumbe Court who was the lucky survey prize draw winner! 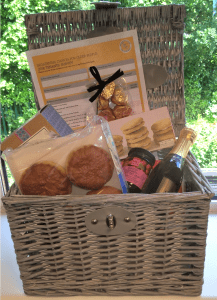 We delivered this hamper of lovely treats for her to enjoy.